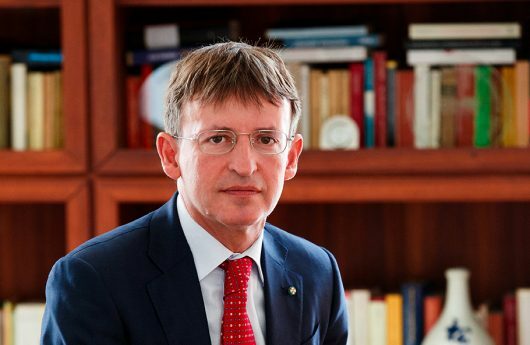 The current ambassador, Pier Francesco Zazo, who was appointed two and a half years ago, has all these qualities on top of being an affable and urbane Italian gentleman. As for his language skills, he is a polyglot. He is bilingual in Italian and German and a fluent speaker in English, French, Russian and Spanish. Before coming to Australia, he has filled a number of front-line diplomatic positions abroad (South Korea, Sweden, Ukraine and Russia) and at the Italian Foreign Department in Rome. He was born in Benevento, an Italian southern city, 50 kilometres northeast of Naples, which is not well-known outside Italy despite its rich historical and cultural heritage. In ancient times it was the capital of the mountain region of Samnium and was able to stand, for quite some time, against the military power of Rome which eventually conquered it and changed its original name of Maleventum, wrongly understood by the Romans as meaning bad luck, into the more propitious Beneventum. A century after the fall of the Roman Empire, Benevento was settled by the Longobards, a Germanic people who ruled large parts of the Italian Peninsula from 568 to 774 CE. Benevento’s church of Santa Sofia goes back to that period and, in 2011, was declared a Unesco World Heritage Site as part of a group of seven historic buildings inscribed as Longobard Places of Power in Italy. Ambassador Zazo belongs to an illustrious family. His paternal uncle, Alfredo Zazo, was a great scholar in history, author of many books, founder and life editor of the prestigious historical and literary journal “Samnium”, and creator of Benevento’s Public Library, which holds possibly the largest and most precious collection of books and documents pertaining not only to the history of Benevento but to Southern Italy’s as well. Moving from this condensed background of his origins to his current role as the head of Italy’s diplomatic mission in Australia, his profile is equally impressive. He is knowledgeable in all the facets of the relations between Italy and Australia and talks about them with buoyancy. An area that Ambassador Zazo is keen to expand are Australian investments in Italy and he is happy to mention the acquisition by Westfield Australia of a contract for the construction of a big shopping centre in Northern Italy with an investment of 1,3 billion dollars. “It is a good development,” he says adding that “the Macquarie Group has acquired Sorgenia, an Italian company producing renewable energy, and 40% of the property of an electric power plant being built in the Dolomites region. The push began about two years ago and there are a number of difficult issues to be resolved. Irish farmers are wary of being outcompeted by a flood of high-quality Australian beef and lamb, and the Italian and French food industries want to protect their regional products from similar ones produced in Australia. Finally, an issue or rather a subject concerning the apparent lack of mutual support when one of the two countries competes to host important international events or seeks a position in an international body. Expo 2015, for example, was contested by Milan and Izmir, and Australia voted for Izmir. Similarly, Italy did not support Australia’s candidature for a non-permanent seat in the UN Security Council in 2013-2014 and Australia is not inclined to support Italy’s candidature for the 2017-2018 biennium. Why is it so, considering that the two countries go along so well in all other respects?